I personally do not like a matte base, sometimes I like it but on the whole I love dewy skin! I think it's important to get the right balance of dewiness in the skin! You don't want to look like a sweaty mess as if you've just ran a marathon or that you resemble a disco ball. It's important to get the right balance. It's important to ensure that your skin is deeply moisturised, using a rich moisturiser will achieve this if your skin is dry and if you have combination to oily skin you want to avoid using moisturisers that are very rich and oily. Using a lighter, everyday moisturiser will ensure the skin is rejuvenated and hydrated but not excessively oily. If you have very dry or very oily skin it can be hard to achieve a dewy finish look because it is hard to get the balance of moisturising and powdering the skin so you do not appear oily. After you have incorporated a moisturiser into your daily and nightly skincare routine you should invest in a good and illuminating primer. 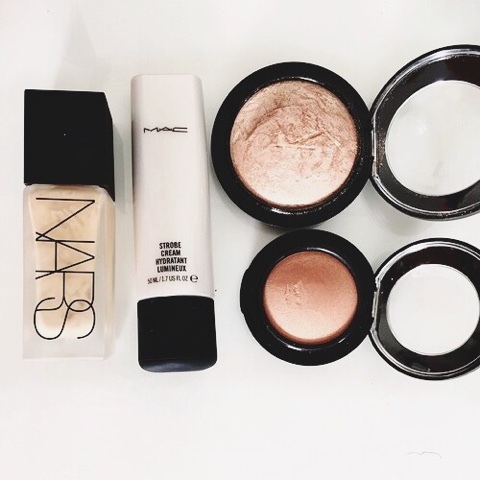 My favourite product to use before foundation is the MAC strobe cream. You can purchase a 50ml bottle from MAC for £24.50 or a travel sized bottle which contains 30ml for £10. A good drugstore alternative is the L'Oreal Lumi Magique Primer. You can purchase this primer in three shades, pure light, light and medium. Both the MAC strobe cream and the L'Oreal Lumi Magique Primer provides the skin with light-medium hydration whilst illuminating the skin. I then like to use my Nars Luminous Weightless Foundation this gives my skin a flawless coverage without feeling cakey. I love this foundation because it is so light weight and weightless on the skin which is perfect for summer time when the air is humid. Thank you to Nars for finally giving us a pump included with our foundation - game changer. A good dupe for this is the Max Factor Skin Luminzer foundation however, this does not provide a full coverage. Whilst it is buildable, it will not give you a completely flawless finish. Regardless, it provides a luminous base which leaves the skin looking radiant. After you have contoured, filled in your brows and applied a few coats of mascara it is time to add the most important step - highlighting. I think this is where the majority of people turn from being healthy and glowy into looking like a disco ball. If you are going for a night out I think a really intense highlight looks gorgeous. If you are aiming to create a night time look I would recommend either The Balm's Mary Loumanizer or the Charlotte Tilbury Filmstar Bronze and Glow. Both of these highlighters are very intense and shimmery and whilst you can just about pull it off during the day, it looks much better at night time when its darker. So if you want to create a day time glowy look using a highlighter, I would recommend MAC's Mineralise Skin finish in Soft and Gentle. If you do not have this product in your collection, I would highly recommend that you purchase it because it is such a great, universal highlighter which is perfect for during the day or night and for light or darker skin tones. This is a champagne/peachy pink highlighter. This will last a very long time as well which is a definite pro. A drugstore alternative for this is the MUA undress you skin highlighters. To complete the look I like to use another mineralised blush by MAC in the shade New Romance. I love this blusher because it looks very natural and skin looking. It is rosey peachy colour and is perfect because it ties in well with a dewy finish because it gives off a little sheen on the cheeks. I like providing dupes for people who are on a budget, so a great alternative are the Max Factor Crème Puff blushes. If you want to see a full review on both the Max Factor foundation and blushers then you can read it here. I know this post is not for everyone but I hope this was helpful for those of you who want to achieve a dewy finish to the skin. I think I will do a matte base as well for those of you who would be interested in that. Stay tuned on Monday because I have a very special blog post collaborating with one of my favourite bloggers. Ooo some great products, I love how you've found cheaper alternatives too! Definitely need to check out the max factor foundation! I'd love to try the Nars Luminous Weightless Foundation!